The title of this blog is taken from a question on Twitter, in which Hester Jansen (@hesterjansen33) asked if the existing modern economic theories are future-proof. If we believe the “dominant” Dutch economists, economic theory is not enriched by Raworth’s work. The qualifications of the economists range from “not going to read” towards “intellectual poverty”. However, ecologists and natural scientists are very enthusiastic about the book. This reminded me of a presentation given by Judith Sanderse on sustainable business models for NGO’s (and other not-for-profit organizations). Afterwards, we were questioned by some disappointed natural scientists, who had attended the session because they hoped for a presentation on the way organizations can improve the environment, greening the earth and saving mankind. Alas, our research is on the way business models can help not-for-profit organizations to organize their activities aiming for long term survival, bridging the gap between financers, subsidizers and their purpose. Judith and I did discuss the point again, thinking about a paper on the trade-off between financial sustainability, which requires stability between income and costs versus the long term mission and purpose of the not-for-profit organization, which often includes social goals, which rather cost money, instead of generating actual income. The way Kate Raworth describes the doughnut is as the area between the social fundament (the human requirements) and the ecological ceiling (the generative capabilities of earth). This suggests a trade-off: because of the growth in consumption, air, land and seas are polluted and the climate is changing. Without pretending to understand all scientific discussions with respect to global climate change, I think that human behaviour has had big negative effects on global warming, the plastic soup and other environmental disasters. Yet, actual research on the doughnut in several regions show both low scores on the social fundament and high scores on pollution, above the ecological ceiling. Rethinking the relationship between social systems and the environment, we see that the (re-)emergency of ‘robber baron’ capitalism in the USA and Russia, but also the dogmatic socialist regimes, combine low scores on food, education, equality and political participation with high scores on pollution and ignoring biodiversity. Trump rejected the Paris protocols and protects oil companies which are building pipes through conservation areas. Putin also supports oil companies polluting Siberia, whereas the industrial elite in Russia squabble over the power. This suggest a reversion of the relationship. On a national level, there is no trade-off between the social fundament and the ecological ceiling, but the social fundament is a condition on the realization of an ecological ceiling. Only in a society which satisfies the fundamental conditions and provides a sense of justice, a government can ask the population to share its wealth with others who are worse off, and to redirect part of the potential welfare growth to finance procedures which aim to keep environmental changes below the ecological ceiling. Yet, this will only be effective if all countries participate. Free-riders will not only disrupt the worldwide effect of the measurements, but will also damage the collective willingness to sacrifice part of one’s wealth, sharing and redistributing income between people and between people and the environment. As said before, there is no dynamic mechanism which will move the present economies towards a sustainable doughnut equilibrium. Yet, this emphasise the importance of financial sustainability on an organizational level. 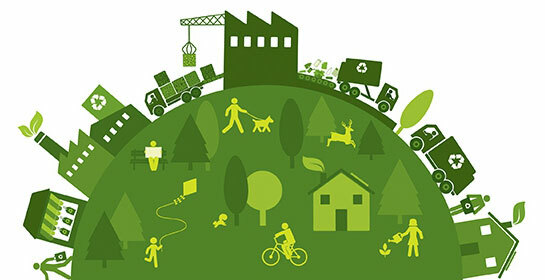 When green sustainability meets financial sustainability, a doughnut could appear. By doing research (we do at the Open University of the Netherlands) into the conditions in which green sustainability can become a competitive advantage, we hope to stimulate the integration of the ecological ceiling into for-profit firms. By doing research into the conditions in which re-use and dismantling of materials can result in a closed loop, we hope to reduce pollution and waste. And also by doing research into the conditions in which not-for-profit organizations can realize their full purposes for longer periods we hope to increase the effectiveness of these organizations, both in the field of the social fundament as the ecological ceiling. If governments in liberal-social capitalist economic systems, can stimulate the co-existence of green sustainability and financial sustainability, by stimulating research in new ‘green’ competitive advantages, the emergence of closed loops or survival of purpose driven organizations, in combination with honest social conditions, a movement could arise which could get an independent dynamic: profit-driven, green in purpose, adjusting to consumer demands, these ways of producing, servicing and improving will cross borders and uses the mechanics of capitalism to realize a converging of green and financial sustainability. 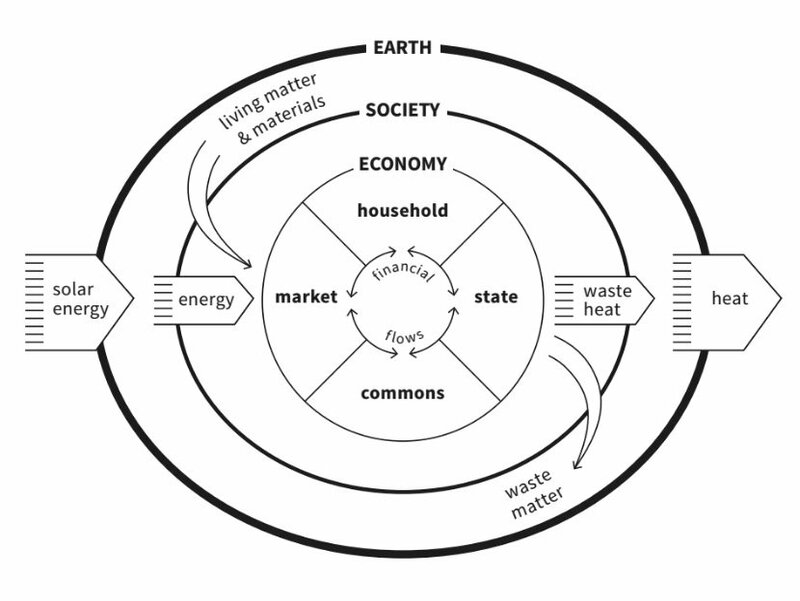 Returning to the question of Hester, I’m afraid that the doughnut shows that we need more than a new economic theory, but the existing theories (including Raworth’s) will not explain the mechanisms which could lead to a greener and safer future. The Doughnut Economy: Eat it or Beat it. Practical men, who believe themselves to be quit exempt from any intellectual influences are usually slaves of some defunct economist (Keynes, quoted in Raworth, 2017, p. 7). By the way, the quote goes on with: Madmen in authority, who hear voices in the air, are distilling their frenzy from some academic scribbler of a few years back. In April I was asked to give a presentation after we had watched a documentary about the ideas of Kate Raworth; labelled the doughnut economy. In a nutshell, the idea is that there are a set of human conditions which have to be fulfilled; these determine the social foundations of the world. Factors as clean water, education, food, but also energy, gender equality and a political voice have to be realized for all. Yet, the production of the social foundation demands the usage of resources, the utilization of the earth. The maximal sustainable exploitation of the natural resources define the ecological ceiling. In some cases, we over utilize the resources: climate change, air pollution and the loss of biodiversity are signs that the resilience of earth is damaged. Raworth postulates that there is a zone between the optimum social foundation and the resilience of nature, the ecological ceiling, humanity can realize its maximal living conditions, without depleting the natural resources beyond recovery: the donut is the dough between human needs and extermination of nature. In this sense, the donut model is a classical economic model, based on a min-max solution trade-off, nature against human desires. However, the model misses any kind of first principles which explain a tendency towards the stable corridor. With first principles I mean certain assumptions about behaviour which cause movements in other variables, interacting and often moving an economy between ‘stable ’states. For example, Keynes assumed that under consumption will lead to more savings, reducing the interest rate, which stimulates investment, raising income and so increasing consumption. (New) Classical economist belief the flexibility of prices and wages to correct mistakes and result in full employment and fair market prices. Marxist economist see the struggle between, workers and capitalists over income, resulting in stable cycles of prosperity and depression. Furthermore, there are economic theories which try to explain why the world is as it is, and models which describe the world as it should be. Marx’s theory on capitalism is an example of the first kind, his theory on socialism an example of the second. As Raworth often uses phrases as the government should……., firms have to…………. and consumers must……; I would label her model as one of the prescriptive kind. In her book see set several conditions for the existence of a doughnut economy: (1) Change the goal from growth towards sustainability (versus goals as GNP); (2) Keep in mind the big picture, economics are embedded in society and nature (versus independent markets); (3) Humans are imbedded in social networks (versus the homo economicus); (4) (Complex) System thinking (versus mechanical equilibrium); (5) Redistribution is more important than distribution: growth will not automatically result in a fair distribution of income and income differences are not necessary for growth; (6) Create to regenerate (versus trust in growth as the solution to all problems); (7) Growth is addictive, stagnation is sustainable. Of course, point 6 and 7 tackles my critique that she doesn’t postulate some kind of theory, as she does not believe in ‘mechanical’ equilibrium solutions. Yet, we know that people, when restricted by income and prices will try to maximize their possibilities, even if we may be criticizing their choices. Poor social choice can be rational from an individual point of view: t-shirts made in sweatshops may be socially shameful, but they are affordable! Problem is that Raworth’s solution is that it requires a green dictatorship to solve free rider and other problems. As just described, there is the tension between social desirable and affordability. Living within the donut involves a redistribution of wealth, on an individual level, but also on a national and international level. Given the Dutch experience with ‘green farming’, taking place at this moment, such adjustments are very slowly and depending strongly on the sensitivity of the middleman. As there is no mechanical equilibrium, some an independent body should enforce solidarity, especially international: financial solidarity seems to decline with geographical distance, but there is also a prisoner’s dilemma: when the others do behave, and we don’t, we can harvest the fruits without paying the price. When I compare Raworth’s ideas with Marx’s theories, I see at least one similarity. 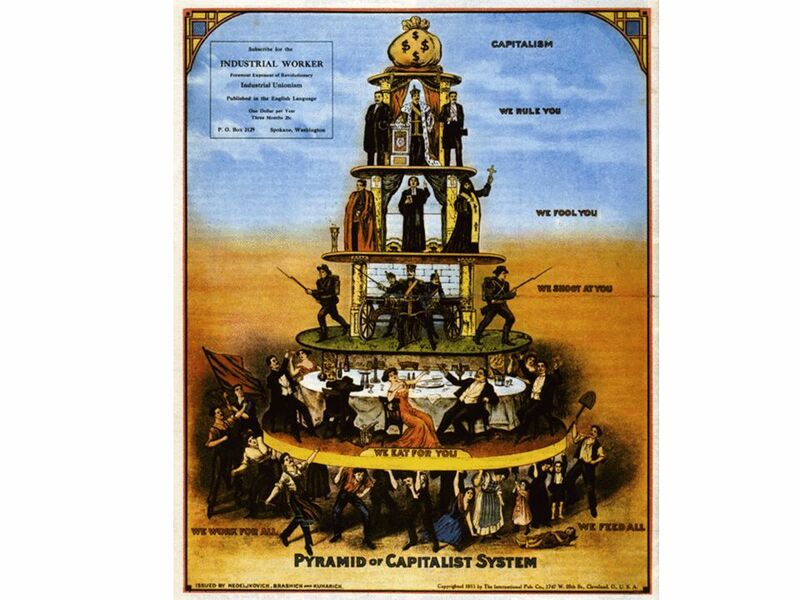 Marx’s theory on capitalism describes tendencies and dynamics which can be observed in modern time capitalism. 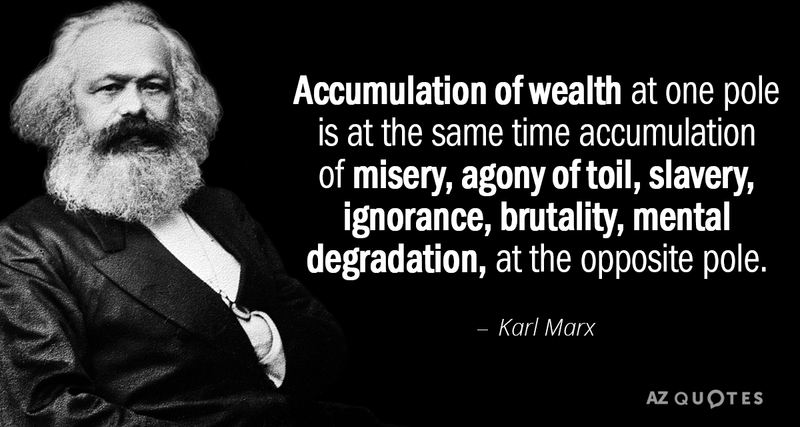 However, his less founded ideas on the socialist state depended strongly on a vision of the worker as a solidary and social being, whereas the practical execution of his ideas has led to several kinds of dictatorships, with different outcomes, but never to the labourers paradise Marx expected. So does Raworth describe several tendencies, as an emergent feeling of urgencies, an attitude of solidarity, the emergence of the sharing and caring economy. However, her solution is built on the same optimistic view of human nature as Marx. On the other side, economists and environmentalists use her model in a descriptive way, concluded that in several countries and regions the social foundation lacks in several ways. In some regions free access to clean water is a problem, in other areas education is guaranteed, at least for boys and is gender equality a big issue. Also, in several aspects the natural resources are damaged. The amount of plastic in the oceans is threatening the survival of several species. Climate change threatens the existence of small islands, changing the living conditions of whole populations. The documentary was interesting, although I think that the supporters of Raworth’s ideas miss some or the points, believing it possible does not make it possible! Raworth, K. (2017). Doughnut economics: seven ways to think like a 21st-century economist. Chelsea Green Publishing. Platforms and Education: a good combination? Now, a new type of alliance is emerging in higher education that is centered around the need to solve common problems rather than to simply bond around mission or geography. One early version of this new kind of partnership was used to build and deliver Massive Open Online Courses (MOOCs) through alliances like Coursera and edX. Now we’re seeing the development of similar alliances to rethink student success for low-income students (such as the University Innovation Alliance) or deliver technological improvements in teaching and learning (Unizen). To survive and thrive in the changing environment for higher education, more institutions must move to form deep alliances and collaborative platforms around nearly every function on a campus—from academic affairs to career services. Imagine if a group of colleges cooperated more to provide their back-office functions of admissions (beyond just sharing a common application), so that they could focus more on recruiting students. Or what if they shared career services resources so that a group of small colleges could better compete against larger universities for the attention of companies looking to hire. On the academic side, institutions can more easily build programs in emerging disciplinary areas such as data analytics or artificial intelligence by doing it together rather than on their own. To attract enough participants both on the consumer and supplier sides, the platform has to provide a special value offer to both. Problem is to define what the differences are between a platform, a network or an embedded organization.Wilfred Rubens wrote a nice blog (in Dutch) on why platforms shouldn’t be applied in education. a. Good distance learning courses are more expensive to make, but less labor intensive to exploit. b. Good blended learning is expensive to make and expensive to exploit. c. There is a difference between information, knowledge and education.d. Even with modular educational programs, there is a build-up of knowledge. I think there are some misunderstandings with respect to the usage of platforms in education. Rubens starts with quoting Scott DeRue, who –inspired by the large student debt in the USA- proposes a system in which rich universities develop free courses, which can be used as basic materials in less well-to-do educational institutions, making education more affordable. Of course as side-effect will be that students from a rich background will get the teachings from the man or woman itself, whereas others may watch the video. The diversion between rich and poor becomes even more explicit when he argues that the costs of an on-campus experience should depend on its (life changing) quality and destroy the programmatic structure of education by splitting it up in micro-credentials. Higher education is not for every citizen, and it must be earned. [..] we need policy makers and business leaders to come together at the same table to help universities, families and students pay for this education in much smarter ways than we are doing today. Yet, In this sense, platforms and the “Netflix”-university will increase inequality and segregation in society, without removing the basic problem: the fact that an education has become an individual investment resulting in large debts. Furthermore, Netflix is an intermediary between the owners of films, series on one side and viewers (end consumers) on the other side. When free courses are used as a replacement of free text books, this educational platform is a kind of B2B network, whereas the final education is delivered by the minor universities. Amy Ahearn points out that platforms as Spotify aren’t as successful for the artists as they might be for the investors. She points out that also on existing educational platforms, teachers are paid badly. An additional problem, in her perception, is that teaching is by and large a female occupation, so the low earnings will enhance the income gap between male and female. [..], platform business models undeniably have huge upsides for instructors. They let people all over the world step into the role of “teacher” for the first time, bringing their niche skills and experiences to an audience of learners. They allow educators to focus on course design instead of having to create and maintain their own digital infrastructure. A platform can also aggregate demand, allowing students who arrive looking for one type of course to organically stumble upon a related offering. These platforms also invest in advertising that drives new customers to courses [..] To contextualize this trend, it’s important to note that teaching has historically been a female-dominated industry, with correspondingly low salaries and low status. In 2011, I have written about the motives of participating in Open Education, for example marketing motives for HEI’s. Generating an individual income from offering OER or MOOCs is not one of them. Most of the contributors to Open Courses do this either as a side job, or social engagement, or expected reputational gains. Elearningsherpa.com does state: You’re busy. You don’t always have all the time in the world to work on you, but you still need gain new skills and get better in order to be successful in your career. Online learning is the best way to pick up new skills and perfect those you already have, and fast. Originally, the supply of open (distance) education was divided into two kind of platforms, the commercial, for-profit platforms (with commercial investors as Coursera) which provide free courses to learners, but try to earn a profit through additional services (assessments, certificates), by transforming the free courses into in company training, or selling the data on the students. The other platforms offer free education because of different motives, for example learning analytics and research, experimenting with distance learning, marketing, inclusion (policy) or a mix of these motives (EdX, FutureLearn, OpenupEd). New online learning platforms (which have to be distinguished from what publishers call ‘learning platforms’) sometimes offer some free courses, temporally free trail periods, and exploit the freemium model. The earning models depend on getting the attention through the free courses, converting this interest into demand for paid courses. Examples are PluralSight, Lynda.com (Linkedin education), Threehouse and Udemy. Some seem to have their own teaching staff (Threehouse), others contributors (Lynda, Udemy, PuralSight), mostly paid per view. Interestedly, there is a parallel with business models, where we can distinguish for profit organizations, social entrepreneurs, who do not aim to make a profit, but have to survive independently of new sponsors and not-for-profit foundations, which live to spend subsidies of third parties. Also new are firms like LumenLearning (USA) and Homuork (Spain) which act as an intermediary between available free educational resources and educational institutions or learning organizations. Are these firms platforms, or not? Their earning model is based on the fact that their customers (firms or schools) do not know where the right free materials are available, nor have they the competences necessary. Instinctively, these firms are excluded from the platforms because they do more than just provide a marketspace were suppliers and consumers of education meet. So there is a lot of dynamic in the e-learning sector. And with that, boundaries become unclear. The diffusion between terms does complicate discussions. Some authors talk about e-learning, others about distance learning, open learning or MOOCs. I think it is important for the discussion to make explicit what kind of learning is meant. In my view, Online and E-learning consists of all kinds of education which involve computerized education. This includes flipping the class room by offering the standard tutorials and assignments in a closed learning management system, freeing face to face time for discussion and complex topics. When online learning is part of a traditional curriculum, it will not fundamentally change education. Open education, including freemium systems, are also delivered through the Internet (with the exception of Open Classes and Studium Generale, where people are invited to attend open f2f lectures). When it takes the form of MOOCs, the courses can be studied independent of tutors and other students. In the case of OER, some teacher has to design a course out of the resources as they often cannot be used by learners. Problem is are the awarding of degrees, the exams and other activities which require staff-student interaction. Distance education, whether open or closed, uses a different didactical approach than traditional f2f teachings. However, it isn’t necessarily less expensive than traditional programs. Good distance education requires a larger investment in the materials than face to face programs. Both the online components as the f2f components of E-learning have to be integrated in the materials. Yet, as the additional costs of teaching are almost zero, it will be less costly in exploitation. In the words of Christensen, distance education has the potential to disrupt the educational sector, as it can provide formal education at lower costs for students. Open Education misses the formal component, so it becomes an excellent instrument to further knowledge in specific fields, where formal acceptancy is less important. Furthermore, when learners move from the free space into the paying space of the ‘platforms’, education becomes either distance education (given the serious suppliers), or it just become MOOCs in their worst form. Online education is just a new supplement, which can change class room education fundamentally, but does not change the system or the costs of education. So will platforms stimulate, disturb or even damage education? Firstly, we have to define what is meant by a platform. Netflix-like platforms as FutureLearn, OpenupEd and other MOOCs-platforms will offer opportunities for learners (but no official recognition) and can function as free textbook providers reducing educational costs. In the last case, they can be disruptive for the text book publishers, but only stimulating for the educational sector. Unaccredited (for-profit) short courses and programs, aimed at professionals, try to reduce their costs by paying low fees (income-per-view). This will reduce the income of independent tutors and authors, but as they do not replace formal educational programs within HEI’s, they will not directly influence teacher’s wages. Question is if these kind of providers can be described as platforms, or just for-profit educational organizations. They will only become real disruptors when the authorities accredited the programs and they are capable to set up a system of assessments without increasing their costs (and prices). Another challenge is the transformation of the MOOCs-platforms from subsidy spending foundations into social entrepreneurs, so they will survive even when sponsors and subsidizers shift their attention elsewhere. There is no doubt that MOOCs and for-profit HEI’s can impoverish higher education and deteriorate the position of teaching staff. However, it is naïve to blame educational platforms, especially because several of them provide Open Education because of social motives. The struggle between private and social entrepreneurship in education is caused by a suspicion that public organizations are inefficient and ineffective compared with private organizations, especially in the United States, but also in several European Countries. Yet, as I started out, a good quality of online or distance education demands large investments which probably will not be earned back at a profit as several investors in commercial MOOCS-platforms are experiencing. A platform can be seen as the intermediary between service providers and consumers, whereby the service providers around the platform are complementors. The platform ecosystem, thereby, embraces (a) the platform owner, operating the platform and core platform offerings as well as mediating between service consumers and service providers; (b) the service ecosystem of complementary product and service providers enabling the ‘whole’ customized solution as offered to (c) the consumers. Scholten, Simone & Scholten, Ulrich. (2012). According to Scholten and Scholten (2012), the greater the amount of complementors, the more valuable the platform becomes for the consumers, as this increases the opportunities to co-create an unique consumer-specific packet of services. Given these quotes, a platform is the linking pin between –on one side- different firms, which next to competing also complement each other; and consumers looking for a unique value offer of combined services. An older form is the “shops in a shop”, where brands like Tommy Hilfiger, DKNY or Armani have their own place within the larger store. Yet, the success of the marketplace depends on the several factors. Firstly, the services offered, as a clean environment, additional services as foods, security and alike. Secondly, it depends on the traffic generated, which in turn depends on the number of brands as well on the other services and products. Lastly, it depends on the trustworthiness and righteousness of the umbrella organization, especially when the cash registers are organized centrally. Virtual networks and platforms will function in the same way. Firstly, what does the platform offer to the customers; secondly, what does it offer the suppliers? One example of a platform containing a multiple of shops, is Wish.com. The funny thing of this platform is that you have to search good, as the same product is offered for different prices at different shops within the platform. Looking for a wooden ring clamp, you get prices between € 3.80 and € 10.00. Some shops have a Wish-quality label, however, it is unclear what this means. Also there are customers reviews and other details available. The platform uses another firm to handle the payments and there is a clear not-received-money-back policy. Looking into the earning models of Michael Rappa from the ‘90s of the former century, the platform primarily earns an income through its function of a broker, bringing demand and supply together, combining organizing the virtual marketplace and the transaction broker. We see that e-commerce organizations as Amazone and Bol evolve from dedicated e-shops (in this case books) towards more general platforms, exploiting their competences in administration, technology and financial transactions moving from an earning model aimed at the final customers towards an earning model based on services to their complementors. In the sense of the platforms above, organizations as Netflix and Spotify are less interesting as they still are dominated by one product and are not capable to enlarge the value of their service with additional complementary services and suppliers. Alibaba Group is a Chinese private consortium based in Hangzhou dedicated to e-commerce on the Internet, including business-to-business, retail, and consumer sales portals. It also offers online payment services, a price comparison search engine, and cloud data storage services. In 2012, two Alibaba portals together handled 1.1 trillion yuan (170 000 million dollars) sales, which is more than its competitors both eBay and Amazon.com combined. Another interesting feature of platforms is the possibilities they open for Makers. Makers are small one-person-one-idea inventors, who are empowered by the internet to transform their original idea into saleable products. Using producers in China, getting capital through crowdfunding sites, 3D printing for conceptualization, wrapping and postal services in Denmark and selling through Amazon or Alibaba, using Skype and Gmail for their communication. People can become more independent of large firms for capital and resources, but may become more vulnerable for (international internet) fraud and of intermediaries and platforms. Yet, good or bad, platforms are here to stay, being part of the way the internet has entered several aspects of our lives. Next time, platforms and eduction, why? Companies making and selling AI software will need to be held responsible for potential harm caused by “unreasonable practices” – if a self-driving car program is set up in an unsafe manner that causes injury or death, for example, Microsoft said. And as AI and automation boost the number of laborers in the gig-economy or on-demand jobs, Microsoft said technology companies need to take responsibility and advocate for protections and benefits for workers, rather than passing the buck by claiming to be “just the technology platform’’ enabling all this change. At the end of last week I attended a presentation about Economy 4.0 and Artificial Intelligence (AI). Idea is that all the expected improvements in services and products, the Internet of Things (IoT) depends on the intelligence of the communication of out machines. Most of the simple repetitive tasks are already computerized; replacing workers either by smart software, or by robots. The next step, which is taken rapidly, are learning algorithms. Learning by algorithms can be described as repeating processes, games or tasks, evaluating the results and adapting the reaction to the initial input. This repetition had to be accompanied by human input, to distinguish right and wrong outcomes. Yet, the last generation algorithms can even learn from other algorithms. By computerizing simple task, so is the expectation, labour productivity will increase by 40%. The learning process requires lots of data on inputs, procedures and desired outcomes. Therefore, Big Data is of importance and is one of the functions of the IoT to generate and analyze data. The idea is to generate so much data that every task becomes simple and repetitive. In the (nearby) future, all task will become divided in simple repetitive tasks. The presenters sketched a future in which people can enjoy a 24/7 economy where interactions are real-time, but with a robot, who can help you based on your emotional pattern, earlier request, request of similar identities and communication with other AI’s in both your and its own network. The underlying models of the algorithms determine the validity of the outcomes of the analyzes and actions. For example, criminal profiling depends on the correctness of the relationship between the chosen profiles and the probability of criminal behaviour. Another example is the fact that advertisements on Facebook and websites are determined by past behaviour. boyd and Crawford (2012) cite Bollier: “As a large mass of raw information, Big Data is not self-explanatory”. Often the remark is heard that after the buy of a pair of sneakers, or in my case a casserole, the algorithms for some time will offer us the same sneakers and casseroles. Learning, then, takes the form of changing the advertisements after I placed a new buy on the internet. A less sympathetic feature is the fact that if you have looked for airline tickets, the price increases with each visit to the website. Some people even reserve one computer for looking and another one for buying! The Financial Times recently asked attention for “The algorithms that seduce our children“: “The tech industry is under scrutiny for how its algorithms manipulate adults but little attention has been paid to how algorithms seduce children, who are far more susceptible than their parents. Children often lack the self-control or even the means to change the channel“. An implicit assumption in the Big Data approach is that every task can be divided in simple tasks which can be described by an algorithm, simplifying complex activities in sets of computerized tasks. Activities which are to complex today can be solved by gathering more data. Yet, as someone remarked: finding a needle in a haystack is not made simpler by adding more and more hay to the stack. boyd and Crawford (2012) compare the influence of Big Data with the assembly line of Ford, stating: “[..] the specialized tools of Big Data also have their own inbuilt limitations and restrictions. For example, Twitter and Facebook are examples of Big Data sources that offer very poor archiving and search functions. Consequently, researchers are much more likely to focus on something in the present or immediate past – tracking reactions to an election, TV finale, or natural disaster – because of the sheer difficulty or impossibility of accessing older data“. Kate Metzler argues that academics in social sciences either lack the access to Big Data or the capabilities for Big Data analyses. According to her, the digital age will result in a division between in company researchers and academic researchers, resulting in a majority of research aimed at selling more, and a minority of research trying to understand social processes and outcomes. The gathering of data also raises issues about privacy and ownership of the data. If my behaviour is recorded by some home device, which learns to make expectations on my personal life: raising the temperature after 5, ordering pizza if I’m not home at 7; it is uncomfortable to know that this data is shared with some anonymous IT-workers in Silicon Valley. Especially when firms, but also government agencies, will use this data to forecast my behaviour and use this knowledge to influence my decisions. To quote boyd and Crawford (2012): “Just because it is accessible does not make it ethical”. Arguments for such actions are often found in “it is convenient for you….”, “it is only to help….”, of “it is for your/the national safety……”. Next to privacy and unwanted influences, data on your behaviour, on and of the web, is worth money. The firms pay the data collecting firms money for the data you have given them. An old internet proverb states that if you don’t pay for the product, you become the product; often followed by the remark that you agreed with the user agreements. Yet, without agreeing with a long list of conditions, you can’t use Facebook, web browsers or other ICT-applications, used for modern communication. So if I want to keep communicating with my family in our WhatsApp group, I cannot state that I agree with conditions 1 – 10, but not with 11 -121. Yet, I still think that there should be some discussion on the ownership of data on myself, or at least have a say in the way it is used and by whom. The emergency of Economy 4.0 will cause serious disturbances, even if the algorithms are right, the needle is found and agreement is arrived. As the Austrian economists as Mises and Hayek already showed around the start of the last century, changes in the real economy take time. When workers become obsolete, this will result in unemployment, losses in income and human capital, with real effects. In that sense, Economy 4.0 can increase inequality and social instability. Economy 4.0 can influence our lives in positive and negative ways. It is expected to increase the ease of use of several appliances, increase quality of life through self-learning and communicating between different machines and applications, mechanization of dirty and tedious work. On the other side, it gives the opportunity for firms, governments and others to influence our behavior in an undesirable way, can give rise to wrong or socially unacceptable decisions, for example by supporting biases etcetera. These (potential) developments ask for a Public Management 4.0; not only in the sense that government agencies apply the new technologies, but in a way that supports the positive sides of AI and IoT, and suppresses the negative sides. To do so, governments have to leading in the knowledge of the underlying technologies, but also make the usage of these technologies transparent. Why is a loan denied, what kind of commercials are financed by whom? And in extreme cases, governments should be able to pass laws, forbidding some kinds of usage of the Economy 4.0 technologies. Next to direct interferences in the negative sides of the technological possibilities, is the obligation to educate the new generations in the do’s and don’ts. So they (we?) know when we are manipulated, know that ‘fake news’ exists, but also see that it requires some effort to make a distinction between good and bad. Much is possible, much will be positive, but to enjoy the advantages of the AI/IoT developments, society has to defend itself against the negative aspects. Business models in international education: what is possible? How local is education in your view? In No education crisis wasted: On Bridge’s “business model in Africa (July 13, 2017), Hengeveld criticizes the way Bridge International Academies (Bridge) organizes their educational model in countries like Kenya (2009), Uganda (2014), Nigeria (2015), Liberia (2016) and India (2017). At their own website, they describe their Academy-in-a-Box: We re-engineered every part of the education system, from teacher training and support, to lesson delivery, construction and financial administration, as well as pupil and teacher feedback to monitor progress, to make it as efficient, effective – and very affordable for the communities we serve….The global education crisis means that it’s essential our education model is sustainable and scalable, that’s why we aren’t an NGO. The model includes 24/7 support of the teachers; following the national curriculum of the countries, incorporating the local context and standards, collaborate with local education ministries; personalized instructions using Wi-Fi handhelds, recording student data, freeing teachers to concentrate on teaching instead of administrative functions; streamlining managerial tasks, freeing managers to concentrate on teachers, families and communities. According to a report of the Global Initiative for Economic, Social and Cultural Rights (GIESCR), Bridge uses “school in a box” model, employing a highly-standardized approach to education. At BIA, every school looks the same, the material used is the same in each classroom, and most importantly, the lessons are the same across all the academies of the same country. BIA uses a system of scripted lessons, and its teachers – who are mostly secondary school leavers without formal teaching qualifications – receive lesson plans on an e-tablet, which they have to follow word by word”. This report criticizes Bridge for several reasons. Firstly, they show that the tuition fees are such that poorer students cannot participate. Secondly, they dispute the compliance with local legal and educational standards. The report points towards research in Kenya(*), that “the majority of BIA students are taught by unqualifed, overworked, teachers using teaching scripts (developed in the US) read from tablets. The school infrastructure is basic and viewed by many as inadequate. [..]. Regular payments are strictly enforced and students who are behind with payments are excluded from the classroom”. Both GIESCR and Hengeveld argue that public investors, as the Dutch government and the World Bank should reconsider their contributions. Whether Bridge International Academies does violate national legal educational and labor regulations is something which I cannot determinate. The arguments in the contra-Bridge rapports are convincing, but Bridge of course deny the observations mentioned above. A different question is whether the business model of Bridge is viable altogether. Taking the strategic paradox De Wit and Meyer (2014**) on internationalization of organizations, they distinguish two perspectives, the global convergence perspective and the international diversity perspective. The first builds on international centralization of management, economies of scale in purchasing policies and sales, increasing efficiency. The second perspective accepts that there are fundamental differences between local markets, customers and governments. Education is a sector which is certainly characterized by international administrative and legal diversity. So each organization which wants to operate on a global scale should take account of the local rules and regulations with respect to curricula, but also to privacy legislation and labor market regulations. react severely when –in their experiences- an organization disrespects or even violates these national laws. Especially when the organization offers formal degrees, local accreditation is essential for recognition. Another question is how general is ‘education’. Is it possible to develop educational materials for the teachers or even for the students which can be used globally? To profit from the economies of scale, there has to be some synergy between either resources (reallocation, specialization), activities (pooling, specialization or competitive local advantages) and in the product offering (standardization, cross-border competition). For example, by designing an international oriented MOOC, the assumption is that the didactical methods are internationally usable. Whether it is an American textbook on sociology, a MOOC on global pollution or a distance course on chemistry, the designers/authors use a didactical method, specific examples and language. What makes some materials broader usable than others; what makes authors think that their materials are internationally usable? For example, starting European students of economics in the 80’s knew more about the American Federal Reserve than of the monetary systems of other European countries. Bridge, but also MOOCs and OER implicitly assume that educational materials are broader adaptable than the development environment. Bridge even states that the material they make available through their tablets can be supplemented by the advice of central organized experts. Of course, the materials made available by Bridge are their own resources. MOOCs are available under creative common copyrights, but are often not adjustable, taking the form of a static text book for use in other environments. Only OER available under the most flexible creatives commons are adjustable and reusable by third parties (teachers). Yet, adjusting these resources, translating them in other languages, subtitling and adding local examples will be a lot of work. If the critique on Bridge’s central approach is right and local education is more effective with local teaching, this also removes the arguments of the possibility to provide less costly education, available for all social classes and incomes. If Bridge’s education isn’t more effective, more accessible and of a higher quality than the local teachings, the business model of this kind of education disappears. But if the central globalization approach doesn’t work for Bridge, will MOOCs and OER be usable outside of the developers’ environment. Three of the shortcomings of MOOCs as listed on the website Online Course Report (OCR, 2016) are the teaching methods, the way content is presented and their Anglo-Saxon orientation. And these are listed as general limitations, not specifically because of local methodology. I would like the opinion of teachers among my readers, How local is education in your view? ** De Wit, B., & Meyer, R. (2014). Strategy synthesis: Resolving strategy paradoxes to create competitive advantage. Cengage Learning EMEA. In two seminal papers, Dahlander and Gann (2010) and Huizingh (2011) try to define openness as used in open innovation. Here, I try to use these definitions of openness in describing openness in education, drawing some lessons for both sectors. Although Huizingh (2011) bases its definitions on Dahlander and Gann (2010), it is easier to start with his distinction between the innovation process and the innovation outcome. Openness in terms of the process is determined by the amount of knowledge which is obtained externally, or developed internally. The openness of the outcome is determined by the fact if the resulting process or product is proprietary or made freely available for external partners. Closed Closed Innovation: proprietary innovation developed inhouse. Public Innovation: the outcome is available for others, whereas the innovation was developed inhouse. Open Private Open Innovation: a proprietary innovation, developed with the input of external partners. Open Source Innovation: both the development as the result of the innovation are open. Closed innovation is the traditional way innovations were developed. The aim of public innovation often is the development of a standard. For example, by making the PC the standard in computing during the 80’s, IBM could control part of the market for personal computers. Another way to divide open innovation is to make a distinction between inbound and outbound innovation. In the definition of Huizingh (2011, p. 4): Inbound open innovation refers to internal use of external knowledge, while outbound open innovation refers to external exploitation of internal knowledge. Dahlander and Gann (2010) combined these types with the question whether there is money involved or not. Revealing seems to be used to attract collaboration, especially in situations without strong IPR regimes. It also resembles Public Innovation of Huizing (2011), in aiming to set a market standard. Sourcing refers to the absorption of external available knowledge to create new products and services. The literature suggests an inverted U-shaped curve: searching for external knowledge will be profitable up to a certain level, after which the “over-search” will become more costly than profitable. There seems to be a paradox in openness: as Huizingh (2011) states, companies perform more inbound than outbound activities (which recently confirmed by studies of the open innovation network, http://oi-net.eu/), yet inbound activities of one organization should generate reciprocal outbound effects from other organizations? As we noted elsewhere (De Langen, 2013), there are a lot of definitions of openness in education. Openness in the sense of free to obtain (MOOCs), free to use (OER) or the absence of entry barriers (Open Universities). If we define the process as a measure of openness of the process, leading to the product, we can distinguish between free to access, free to use or even collaboration in design and production. The outcome is the education, the course or the program. Traditional education is mostly distributed in a closed form: it is exclusively for students of the institution. Traditional education is often designed and developed by a single teacher, by an internal group of teachers (both examples of closed process) and in some cases with developers outside of the own institution (often subsidy-led) or the usage of open resources and MOOCs. The Open Outcome-side describes the production of open educational products and services. The closed production of open outcomes are typically of the production of MOOCs. A situation of open production and open outcomes is found in situations where communities both develop and use educational resources. For example in the case of knowledge bases and portals, developed and exploited by communities of fellow teachers; two examples are MERLOT and FEmTechNet. b. MOOCs, where the product is free, but the process of developing the course is proprietary. c. Certain forms of Open Access, in the sense that the production process belongs to the researchers (holding the copyrights, sometimes having to pay a fee), whereas the published research results are free for the public. Open Use of free: the use of free (open) resources to develop educational resources for traditional institutions; for example Lumen Learning offers to teach educators to use OER to develop courses and programs for usage within traditional institutions. Open Education: Open educational resources, DOCCs, communities of practice and alike. Pecuniary Acquiring textbooks and materials. Selling knowledge, texts and competences. Non-pecuniary Sourcing: collaborating to acquire knowledge and resources. Revealing: collaborating to supply knowledge, competences and resources. Another way to categorize education is based on Yunus et al. (2010). In their view, organizations optimize either financial profit or social value. On the other dimension, they distinguish the way organizations are financed: either they have to earn back the invested capital, or they don’t. In this last case, another organization will supply the funds necessary for the long term survival of the organization. Traditional HEI’s were placed either in the Not-for-profit category for public education; or in the For-profit-category for private educational firms. Interesting are those organizations (websites, portals, knowledge bases ect.) which resulted in the past years, as result of inter-organizational collaborations, subsidies or individual initiatives. Next to the educational knowledge and competences, their survival will depend on the capability to generate funds to reimburse the capital used in the production and exploitation of open education. Dahlander, L., & Gann, D. M. (2010). How open is innovation?. Research policy, 39(6), 699-709. De Langen, F. H. T. (2013). Strategies for sustainable business models for open educational resources. The International Review of Research in Open and Distributed Learning, 14(2), 53-66. Huizingh, E. K. (2011). Open innovation: State of the art and future perspectives. Technovation, 31(1), 2-9. Open Innovation in European industries (2015), study for the European Commission, http://oi-net.eu/. Yunus, M., Moingeon, B., & Lehman-Ortega, L. (2010). Building social business models: lessons from the Grameen experience. Long Range Planning, 43, 308-325. Recently, I was asked to suggest a business model for a research and education center. Some organizations aimed to work together in the field of innovation and regional knowledge sharing. Aim is to make the center sustainable in the sense of Yunus et al. (2010). They describe Social Businesses as an organization which aims to earn enough to renew the invested capital combined with social profit maximization: At the same time as trying to achieve their social objective, social businesses need to recover their full costs so they can be self-sustainable. Already several earning models of the kind Rappa describes at his website were discussed, however, a business model involves more than only an earning potential. So starting out with the assumption that in research each question is unique, this defines n=1. The methods of academic research may be more or less modeled in a stage model, each query will need different data bases, different academic specialties and competences. The same applies for education. Taking aside learning styles and other contextual factors, the group of intended learners will have specific work and practice related needs. how the network organization can attracted the necessary resources to organize the activities needed to fulfill the unique demands of the customers? How to organize the earning model to make the center self-sustainable as a social business. Note that in a network organization there are two sets of key resources and key activities as mentioned in the Osterwalder-Pigneur business canvas: firstly the resources and activities aimed at fulfilling the needs of the customer, the realization of the value offering. These factors have to be found in the relationships which make up the network of the organization. The key resources and activities within the organization have to do with setting the conditions necessary to activate the former external resources and activities. The internal resources and activities as relationship management, ‘the black books’ and communication and organizational skills are the core competences of the network organization. Money is often an important persuading factor, but reputation, knowledge sharing and strategic issues can also convince organizations to work together in a network setting. The assumption is that the main customers of such a model are other organizations, having specific research questions, wanting to school their employees. The aim of the network organization is to match demand by organizing its partners into a relevant supply. The actual business model is inspired by a model some colleagues of mine had developed some years ago for a HEI. It consists of different layers, each aimed at a specific audience, but building on each other. Analyzes and sales of data on potential customers; email addresses ect. In terms of Rappa’s earning models this is a combination of the advertising and the infomediary model. In Rappa’s taxonomy, the Freemium model of Anderson (giving away something for free; earning an income by offering additional services or products) is part of the advertising model. In the second layer (registered) visitors find a supply of standardized service and products, for example courses based on existing courses of the participants, workshops and alike. Interested parties can either participate or buy products on a pay-as-you-go base, or –in the case of changing offerings- take a subscription. The utility model assumes the first case, whereas the subscription model differs from the description here as they assume the subscriber also to be a member of the network. Here, I would label the participants of the last two layers as members. Members of the third layer become part of the community in the sense that they can freely use courses and existing research. Furthermore, they can participate in discussions and influence the direction of new research and the educational course of the center. This level can be compared with a regular student at a HEI, who has pays a yearly fee and is during that year free to use all the facilities and courses at the institute. Of course, for specific studies or custom made courses and other on-demand the subscribing member has to pay an additional fee. The fourth layer consists of the full participants, the suppliers of services and products supplied in the three other layers. New full participants should pay a fee reimbursing the others for the initial investment costs, getting the right to promote and sell their own products and services within the center. Overall, such a center will act as a broker between the participating organizations and individuals or organizations seeking the products and services on offer. In the brokerage model, income is earned by charging a commission or a fee either based on actual transactions or as part of a general agreement. Yet, at each level data is generated which could be used to create value for (potential) customers and partners, again creating income. Another additional source of income could be regional and national subsidies as governments often stimulate geographical collaboration. Changes are that an actual implementation of such a model will require some adjustments, for example the privacy regulations with respect to adjustments to the gathering and usage of data are strict; in a world of ever falling government budgets, subsidies may be small or non-existent. Still, a business model which generates income through its communities can afford to sustain Open Education and Open Access (research), which in itself will not be sustainable. It would, therefore, be interesting to see if an institute or center build on these principles would be self-sustainable in the sense of Yunus et al (2010), combining a social goal (Open Education, Open Access), while at the same time covering the full costs. Ben Janssen, a former colleague who started his own consultancy on change and (open) education, and myself discussed several experiences we have with open educational resources and alike. “in my work as an external consultant I often find that departments within an organization are working on the same projects, starting the same pilots and the same programs”. Even over organizations he sees the same phenomena: organizations who work on the same projects without knowing what happens a stone throw away. By opening up, organizations make this kind of information available for potential partners. In the same sense as commercial organizations try to innovate through openness and collaboration, offering knowledge and materials invites others to collaborate and improve on the original resources. Yet, as in open innovation, organizations should do so from their own strength: giving away your core competences is bad business, even when you’re not in business. So opening up education in this way offers the possibility to share programs, or as Wiley (2014) argues, developing competence profiles and the accompanying programs, techniques and assessments. By offering open competence programs, more institutions can develop new experiments based on these programs, improve and change the programs, which will feed back in the education of the original developers. This line of thought opens an interesting question: What is the core competence, resource, program or technique of a specific educational institution? What is the distinctive characteristic which distinguishes one HEI from another? There is also a dangerous side to these possibilities. We know that both governments as boards of HEI’s have seen Open Educational Resources, MOOCs and other open educational materials as a way to reduce teaching costs. It causes a paradox: using OER can decrease teaching costs, producing OER will increase costs of the organization. The sensible management decision will be to demand that people use OER in their teachings, forbidding them to produce free materials for others. In the ’70s of the former century, this was called the innovation paradox and used to explain why the national level of innovation will be below its potential level. Cure for this paradox is a good system of IP’s, so the inventing firm can also secure the income of the innovation. This remedy is of course impossible in a system which is built on openness. Protecting OER with IP-rights would remove the essence of sharing. there has to be an external force redistributing income over the producers and users of OER. This could be an internal authority, for example the board of the HEI, which can stimulate the development and use of the same supporting courses (for example, the development of an open course on statistics for non-mathematical studies; developed by the intern mathematical department). The development costs can be earned back as usage outside the own department is rewarded by additional funding by the board. On a national level, government agencies could reward the supply and use of open courses by subsidizing the suppliers, without punishing the users by cutting back there teaching funds (which in itself is not a challenge for the HEI’s, but more for the politicians to resist the temptation to save money on the education budget). Yet, by reading each other signals in the sense that organizations will open-up non-core courses; collaboration in these fields can make education more efficient and effective. 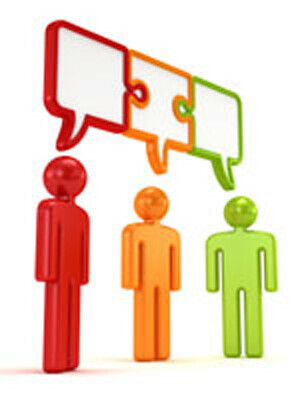 As Janssen said, collaboration needs communication. Specialised teachers can provide free courses for non-specialist students, freeing sources to develop better and more courses, flipping the class room and freeing students from uninteresting class room lectures. A win-win situation could be possible if we would agree to communicate our “weaknesses”, offering our “strengths” to our colleagues.